first things first... thank you all you sweet ones who shared a tear with me about my tights. you made me smile through that difficult time. 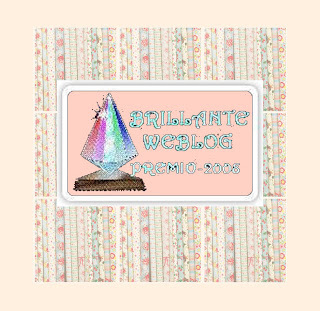 everyone has pretty 'brillante' blogs, so i wish to send to everyone. but i'm tagging the sweet and adorable sweet dreams till sunbeams find me.. soir de fete , rags and scribbles , fabulous blog! ok, yes, i did change it, but only because the other one was harsh, not because i think i'm cool. just the black was way too harsh, and then i thought, i may as well put a background on it. sorry, hope it doesn't offend. i'm not clever. but for my benefit i thought i may as well. anyway, this is really cute of you all... so, thank you! i went to work this morning, and was in a rather cluttered office, but i got a 'well done' and a 'i'm glad you're here', from the not-so stressy/scary lady that everyone made out she was. i caught the bus home at 2ish. and i felt myself getting lost in the words of my music. and found myself bound in nothing other than sad thoughts. i tried to sleep it off, but couldn't settle. so i got my old cdplayer from under the bed and listened to old music again. it cheered me up, like last time. but not because the memories of certain songs were happy, but because they were silly, insignificant thoughts, a tiny spec of hilarity at some. but just felt a reassuring bubble appear inside of me. so i downloaded on to my ipod for my next bus trip...... whilst eating a pink lady..... i mean apple. this will now 'make you laugh so much you will fall of your chair it's so funny' (the holiday) whilst importing the cds, i thought i'd listen with the earphones, and have it on so loud. dancing along, singing the odd line out loud.......... the lovely mother of mine touched my shoulder, and i screamedddd so loud that i forgot to stop screaming! that tought me never to have my music on full blast ever again. this is a super long post today, sorry. but just to finish my day, i went to watch the younger brother in another performance. modern dance this time. he was great. mother and i were clapping along to the upbeat, fun dances. it was so much fun. anyway, apologies from me please accept if i've made you fall asleep at the computer. AW! Thank you for the tag lovelie, and I like your version of the award much better than the black one. If you are feeling down you should watch under the tuscan sun- it is my best friend's go-to movie when she is bummed, and it invariably works. Also, yes, you may ask why I am venturing to your side of the pond, and the answer is this: I love England, Scotland and Wales (though I've only been to England), I am taking two years off college to live and explore the world, and I want to be in the UK because it's calling to me. Oh, and I was just looking at your old posts and saw the cupcakes and am now going to dash out and get some flour so I can make some of my own. p.s. if you are still there when I get there (there being the UK) we can have a tea party for real! haha I had my own long note, and I forgot to tell you what type of place I am looking for- which is anywhere but london, cityish is alright, countryish is alright, as long as I'm there it's alright! Ha-ha, mothers can be frightening, especially when least expected. I feel like a fool because I jump out of my skin all of the time at work! I like your background. your award looks great! i didn't put mine on my blog because of the black, so i love what you did with it! Thankyou for the tag sweetie i read your blog everyday - and i think you are very cool too! I much prefer your pretty premio version as well. Don't fall asleep at the computer. Hope you get some rest. Love what you did to the award. I liked the way you changed it, it's prettyer like this. Thank you so much for tagging me, I'm so honored cause I love your blog too, and because of the fact that you're a fashion student and i'm not! Thank you again and I hope you'll get a Fabulous feeling every time you visit my blog! Re: ha ha i know what you mean about madonna! She was pretty fabulous in the 80s but is not for me any longer though! Ohhh Pink Ladies are the BEST apples ever! I recently found your blog and I love it! Mind taking a look at mine? Au revoir! I will be back soon! oh, you look so so pretty, doll!